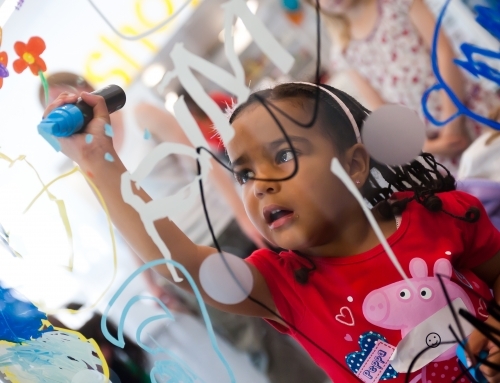 On Sunday, the 27th of January, the People’s History Museum would like to invite families to their SEND-friendly family day, which is free and is suitable for people aged 5 and up. 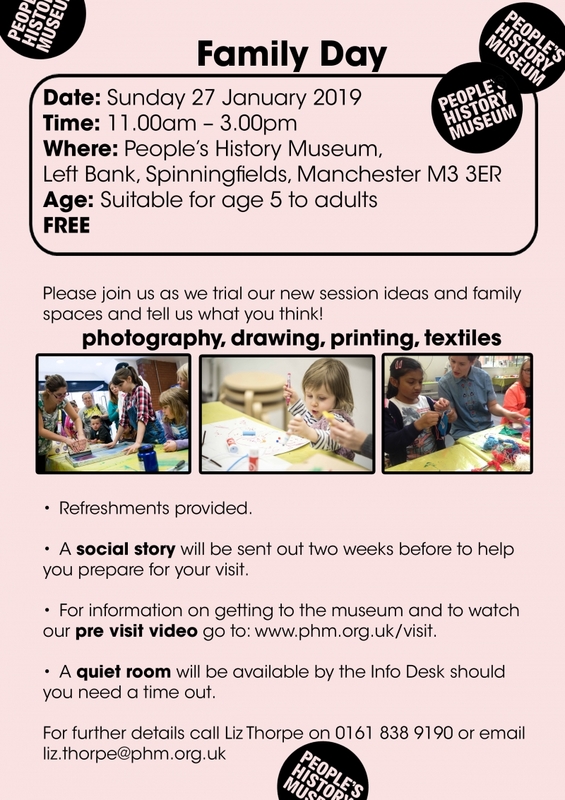 This is an opportunity to trial PHM’s new session ideas and family spaces, as well as a chance to meet fellow families with SEND (special educational needs and/or disabilities), specially Manchester Parent Champions, who were instrumental in PHM’s undertaking to make the museum more SEND-friendly. The day is flexible and all sessions are drop in. PHM will have an iPad available for the photography workshop, though they recommend bringing your own smartphone or digital camera. If you have any sensory sensitivities, helpful communication tools and access requirements that you would like PHM to be aware of/made available, please contact Liz Thorpe at 0161 838 9190 or liz.thorpe@phm.org.uk prior to the day. Liz is People’s History Museum’s Learning Officer for schools & families. 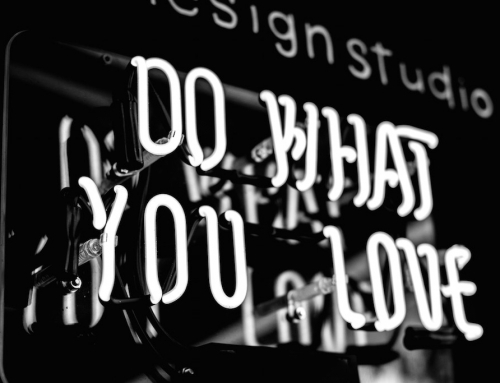 This day is all about finding out what you think. 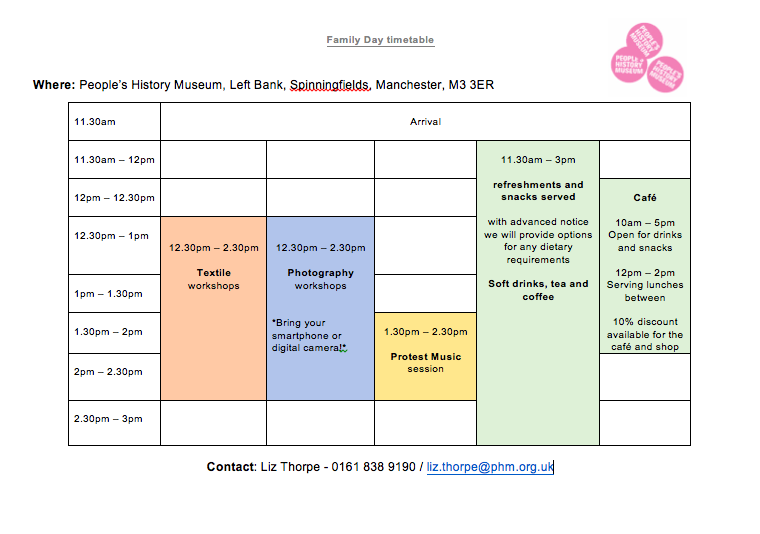 We recommend aiming to arrive at 11.30am so you have time to explore the museum and leave feedback. I have tried to make this fun and creative rather than just a traditional form so please do take the time to complete. We will be providing soft drinks, coffee and tea along with snacks throughout the day. Please provide any dietary requirements before Monday 21 January. There are picnic tables to bring your own lunches. You can buy hot meals and drinks at the café using a 10% discount voucher. There is a reduced meal service at the weekend but stew and soup will be available. There will be a dedicated and well signposted Quiet Room by the Info Desk on the ground floor. Please visit PHM’s website for accessibility information and how to get to/from the venue. Thanks to People’s History Museum and the Manchester Parent Champions for working together to make the museum more SEND-friendly. All photos, the PDF of the social story and the embedded video are property of People’s History Museum.